The Super Mind Evolution System presents the most powerful and brilliant system for uncovering the secrets of mind power. This system is the result of ten years of in depth research into highly advanced techniques. When you sign up free, you get instant access to your member area where you can download seven great manuals and a wonderful free alpha mind control audio meditation. However, you may want the Gold membership to get the FULL Super Mind Evolution System. It's definitely worth the upgrade. This impressive system is a complete Alpha training, presented in twenty-three neat and easy to comprehend step by step manuals, plus twenty-two dream programming audios. The audios of course are all in mp3 format, so you can load them into your mp3 player and listen before sleep. If you do not wish to use all the included material, you can also purchse single items without becoming a member. 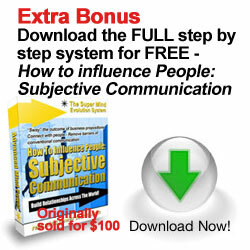 One of the many things that I love about Super Mind Evolution System is the fact that it stands outside the ever-present marketing hype, and instead really provides value. You can say, Iain Legg, the initiator of the program, truly over-delivers. Besides the training materials, he provides a wealth of free manuals, a weekly newsletter that is always filled with valuable content and helpful tips and inspirations, and a great community where nobody is left alone. This training is perfect for people who do not like to go through months of studies before the first small result can be expected, but want to jump directly into getting control over their life, solving problems and getting fast results. The course is built in themes. It starts with a basic Alpha training, and from there you can pick what interests you most, any time you want. From remote viewing, to finding your purpose in life to dream programming, to The Celestial Luck Program, losing weight, attracting the perfect partner, self-confidence, to financial abundance - just to name a few. You can find the right technique for every theme and circumstance. I find that Super Mind Evolution System makes tapping into the Universal abundance easy since it uncovers the natural abilities of the mind, which we are all born with, by showing - without tons of theoretical stuff - how to consciously use them. It re-empowers us to claim our birthright and put our natural abilities into practice. For me, the main value was in creating a new and fresh view of all the knowledge and ideas about the relationship between thoughts and manifested reality I already had but was not always able to manage properly. Plus, I received some stunning new ideas which filled in some of the gaps; especially how our emotionally charged thoughts are like "emails" constantly communicating with the morphogenetic field, which invisibly connects everyone with everyone. My understanding has reached a new level and creates a clear focus and thought control throughout the day. Amazing synchronicity is just the inevitable result. Be sure to turn your speakers on, so you can watch the video on RMPS's website!